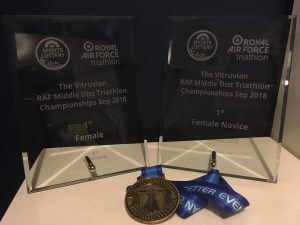 A Royal Air Force Reservist has won two trophies after completing the Vitruvian Triathlon which was held at Rutland Water in early September (8/9/18). 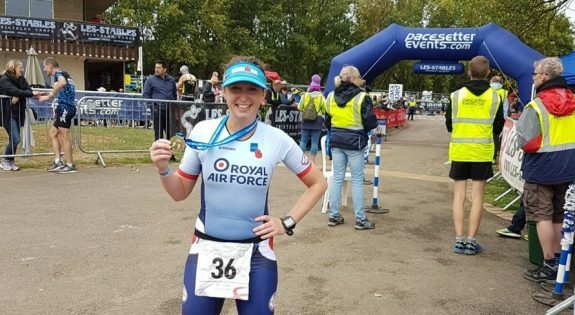 This was the first Vitruvian for Gemma Hughes, an experienced triathlete who recently began serving with 7010 (VR) Squadron, part of the RAF’s Intelligence Reserves Wing. She won both the RAF Championship and the RAF Novice Lady after coming ninth in her age bracket, finishing all three disciplines in under five hours and twenty minutes. The Vitruvian triathlon has more than 1000 participants and each needed to swim 1.9km, cycle for 90km before finishing the race with a 21km run. The race doubles as the UK Armed Forces and RAF middle distance triathlon championships, with a large number of Armed Forces personnel taking part every year. Gemma added: “The swim was a highly energised two laps, the bike ride involved some fast downhill but also some steep inclines to burn out your legs and the run went around the lake. The RAF Intelligence Reserves Wing is currently recruiting, to find out more about joining search RAF Intelligence Analyst or call 0345 606 9069. To stay informed please select below which you would like to be signed up to, enter you email address and press subscribe. Army Reserve Centre, Triumph Road, Nottingham, NG7 2GG.